Update: Activist Post has been restored! Each day more people question why we have a private Federal Reserve that creates money out of nothing and exerts Communist-style central economic planning for the benefit of bankers, the 9/11 fable and other false flags, vaccines, fluoridated water, endless wars of military conquest and the absurd war on drugs. Google is a CIA/NSA front company that collects information on its users and social trends based on Internet traffic. "The CIA’s technology investment operation, In-Q-Tel, and Google are supporting a company that monitors the web in real time. The company, Recorded Future, scans tens of thousands of websites, blogs and Twitter accounts to find imputed relationships between people, organizations, actions and incidents. Recorded Future claims it can utilize this information to predict the future." Google founder Eric Schmidt attended the 2008 and 2011 Bilderberg meetings, where David Rockefeller and Henry Kissinger most likely gave him his marching orders. Google has a history of censoring constitutionally protected political speech and the alternative media. Earlier this year Google-owned YouTube censored a video clip showing Eric Schmidt at the 2011 Bilderberg Group conference, by removing the “honors” associated with the Alex Jones Channel and preventing the clip from being widely viewed. YouTube also has been caught distorting “channel views” and deleting popular documentaries such as The Obama Deception. During November of 2010, Google’s news aggregatorblacklisted Prison Planet and Infowars despite the fact that both websites are internationally known and now attract more traffic than many mainstream media websites, while Google-owned YouTube temporarily froze the Alex Jones Channel based on a spurious complaint about showing Wikileaks footage that had been carried on hundreds of other YouTube channels for months. Google’s deletion of Activist Post and acts of censorship build upon the CIA’s Operation Mockingbird. Starting in the early days of the Cold War (late 40s), the CIA began a secret project called Operation Mockingbird, with the intent of buying influence behind the scenes at major media outlets and putting reporters on the CIA payroll, which has proven to be a stunning ongoing success. The CIA effort to recruit American news organizations and journalists to become spies and disseminators of propaganda, was headed up by Frank Wisner, Allen Dulles, Richard Helms, and Philip Graham (publisher of The Washington Post). Media assets will eventually include ABC, NBC, CBS, Time, Newsweek, Associated Press, United Press International (UPI), Reuters, Hearst Newspapers, Scripps-Howard, Copley News Service, etc. and 400 journalists, who have secretly carried out assignments according to documents on file at CIA headquarters, from intelligence-gathering to serving as go-betweens. The CIA had infiltrated the nation's businesses, media, and universities with tens of thousands of on-call operatives by the 1950s. CIA Director Dulles had staffed the CIA almost exclusively with Ivy League graduates, especially from Yale with figures like George Herbert Walker Bush from the "Skull and Crossbones" Society. The deletion of Activist Post is the progression of White house information czar Cass Sunstein’spolicy of speech and thought repression. Sunstein, who authored a white paper calling for banning “conspiracy theories,” demanding that websites be mandated by law to link to opposing information or that pop ups containing government propaganda be forcibly included on political blogs. In a set of proposals designed to counter “dangerous” ideas, Sunstein suggested that the government could, “ban conspiracy theorizing,” or “impose some kind of tax, financial or otherwise, on those who disseminate such theories”. So-called “conspiracy theories that Sunstein said could be subject to government censorship included beliefs held by the vast majority of Americans, such as the notion that the JFK assassination occurred as part of a wider plot. In his white paper, Sunstein also cited the belief that “global warming is a deliberate fraud” as another marginal conspiracy theory to be countered by government censorship. Sunstein is no entrepreneur when it comes to free speech suppression as his policies are reminiscent of Nazi Propaganda Minister Joseph Goebbels. One of Goebells first acts was the burning of books rejected by the Nazis. He exerted totalitarian control over the media, arts and information in Germany. The ambitions of the Propaganda Ministry were shown by the divisions Goebbels soon established: press, radio, film, theater, music, literature, and publishing. In each of these, a Reichskammer(Reich Chamber) was established, co-opting leading figures from the field to head each Chamber, and requiring them to supervise the purge of Jews, socialists and liberals, as well as practitioners of "degenerate" art forms such as abstract art…Goebbels’ orders were backed by the threat of force. Control of the arts and media was not just a matter of personnel. Soon the content of every newspaper, book, novel, play, film, broadcast and concert, from the level of nationally-known publishers and orchestras to local newspapers and village choirs, was subject to supervision by the Propaganda Ministry, although a process of self-censorship was soon effectively operating in all these fields. No author could publish, no painter could exhibit, no singer could broadcast, no critic could criticize, unless they were a member of the appropriate Reich Chamber, and membership was conditional on good behavior. Eastern Bloc information dissemination was controlled directly by each country's Communist party, which controlled the state media, censorship and propaganda organs. State and party ownership of print, television and radio media served as an important manner in which to control information and society in light of Eastern Bloc leaderships viewing even marginal groups of opposition intellectuals as a potential threat to the bases underlying Communist power therein. During the Stalinist period, even the weather forecasts were changed if they would have otherwise suggested that the sun might not shine on May Day. Under Nicolae Ceauşescu in Romania, weather reports were doctored so that the temperatures were not seen to rise above or fall below the levels which dictated that work must stop. Censorship in the People's Republic of China is implemented or mandated by the Communist Party of China . Censored media include essentially all capable of reaching a wide audience including television, print media, radio, film, theater, text messaging, instant messaging, video games, literature and the Internet. Chinese officials have access to uncensored information via an internal document system. China's Internet censorship is regarded by many as the most pervasive and sophisticated in the world. According to a Harvard study, at least 18,000 websites are blocked from within the country. 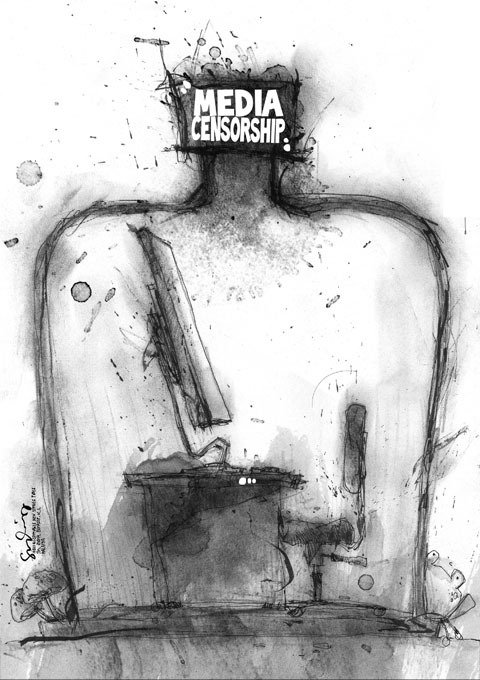 Sunstein is not alone in his desire to suppress free speech by censoring the Internet. According to the great-grandson of John D. Rockefeller, nephew of banker David Rockefeller, and former Senate Intelligence Committee Chairman Jay Rockefeller, the Internet represents a serious threat to national security. His belief that the internet is the “number one national hazard” to national security is shared by the former Director of National Intelligence Mike McConnell and Obama’s current director Admiral Dennis C. Blair. Likewise, Senator Joe Lieberman stated, “Right now China, the government, can disconnect parts of its Internet in case of war and we need to have that here too [in the United States].” The Senator’s reference to China is a telling revelation of what the cybersecurity agenda is really all about. China’s vice-like grip over its Internet systems has very little to do with “war” and everything to do with silencing all dissent against the state. Lieberman himself proved to have the power to shut down websites with a mere phone call, as was underscored when Amazon axed Wikileaks from its servers after being pressured to do so by Lieberman’s Senate Homeland Security Committee. If the globalists have their way, the light of free speech and the alternative media will be extinguished from the Internet. In conclusion, the globalists’ agenda is collapsing faster than the debt-based economy due to the alternative media exposing their crimes and informing the public. The elites know they are losing the information battle and are acting out of desperation. That is why they censor the alternative media and why they deleted Activist Post. I am confident that Activist Post will return stronger and better than ever. In the meantime, please continue to share important articles from the alternative media with your friends, family, and contacts. The elites are up against the ropes and with your continued help, their global fascist agenda will soon suffer the long-overdue knockout punch. Ethan Jacobs holds a Juris Doctor and Bachelor of Arts degree in Political Science. His passion is researching and writing about important issues to defeat every form of tyranny over the mind of man.